Down to Earth Kaka'ako on the ground floor of Keauhou Lane Apartments at the corner of Keawe and Pohukaina Streets, one block mauka of SALT. 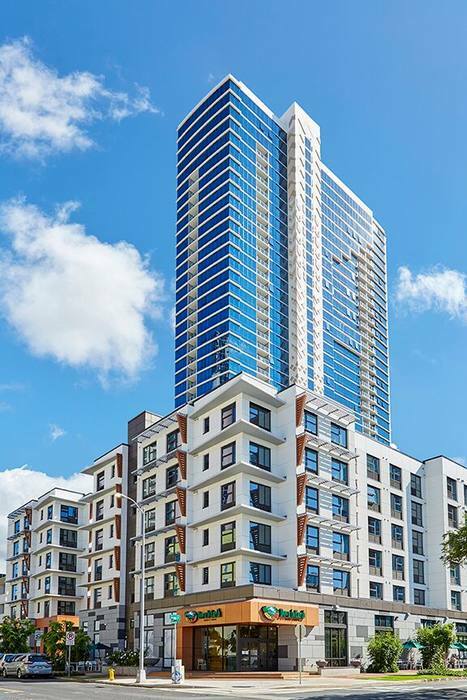 Free parking is in the 42-story Keauhou Place condominium high-rise, which towers over Keahou Place. 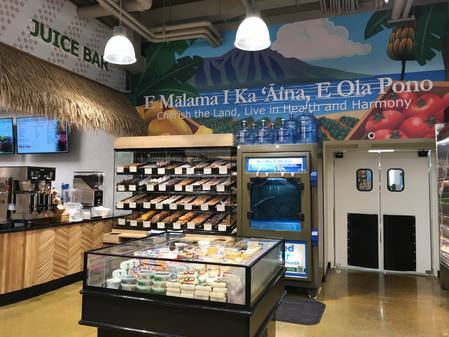 Kakaako Store Entrance on Pohukaina Street. Parking entrance for customers of Down to Earth Kakaako. 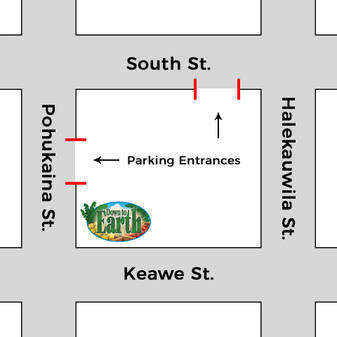 Map showing entrances to Down to Earth Kaka'ako store. Paseo entrance to Down to Earth Kaka'ako store. 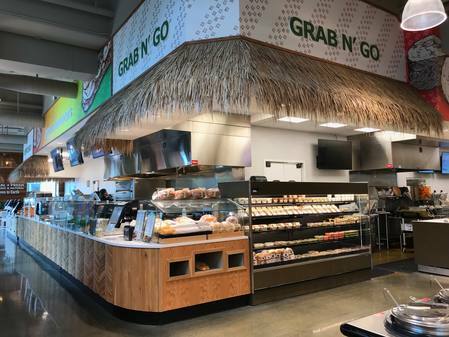 Grab n' go section of the Down to Earth Kaka'ako deli. Deli hot table at Down to Earth Kakaako. Dining area at Down to Earth Kakaako. 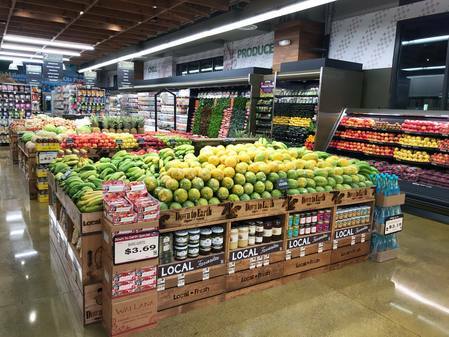 Produce Department at Down to Earth Kakaako. 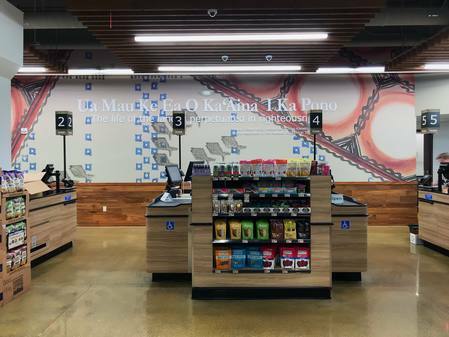 Hawaii State Motto against kapa art background overlooking check-out registers. 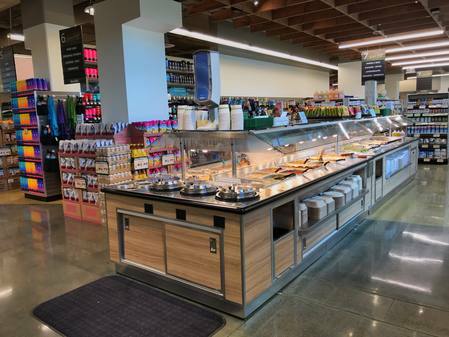 This new expansive 13,000 square foot location (Down to Earth’s largest) has everything you love about Down to Earth plus so much more, including a huge, expanded deli! 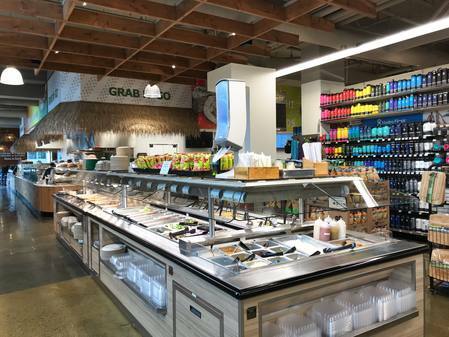 New deli options include take home or eat in fresh baked pizzas, made-to-order wok fried Asian style bowls, vegetarian sushi and much more! Create your own custom plate at our acclaimed hot table and salad bar—with over 60 items to choose from! 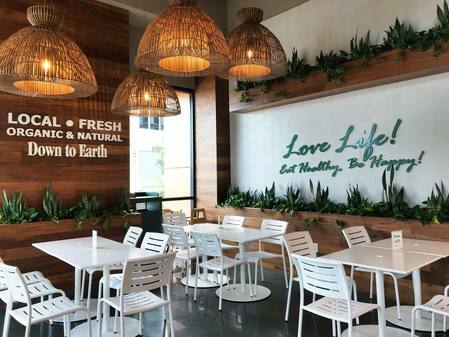 Order from our wide assortment of made-to-order deli items including sandwiches, smoothies, organic espresso drinks, fresh juices and more. Our in-house bakery will serve fresh breads, delicious scones, muffins, donuts and more, all made fresh daily. When you're ready for something sweet, you gotta try our famous desserts! There's something for everyone. Choose from cookies, cupcakes and decadent bars to generous slices of cake, cheesecake and pies. 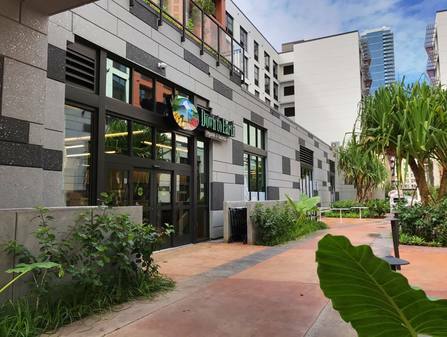 You’ll also find local fresh organic produce; organic and natural foods including dairy items; vitamins and supplements, organic and natural beauty products as well as natural household items. On-Street Metered Parking available nearby. 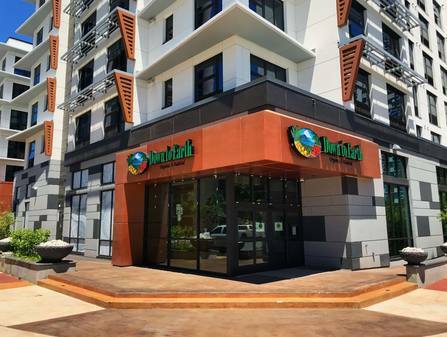 Free 2 Hour Parking with Validation and a minimum of $5 purchase in the Keauhou Public Parking garage which is part of the Keauhou Lane apartment complex. 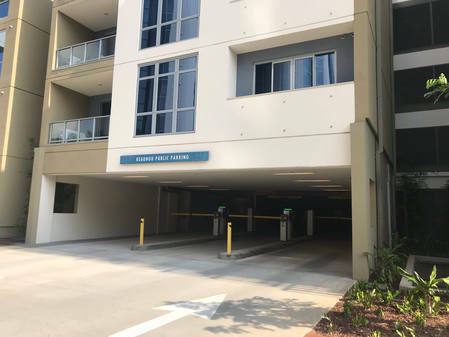 You can enter the Keauhou Public Parking garage via Pohukaina (in between Keawe Street and South Street) or you can enter through South Street (in between Keawe Street and Halekauwila Street).